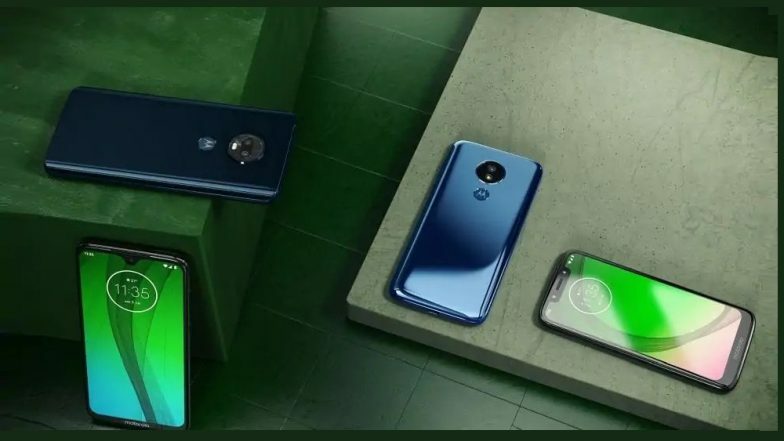 New Delhi, March 25: Lenovo-owned Motorola on Monday launched Moto G7 and Motorola One in India for Rs 16,999 and Rs 13,999, respectively. Both the Moto G7 and Motorola One would come in clear white and ceramic black colour variants starting Monday at Moto Hub stores, authorised retail outlets and Flipkart. The G7 comes with an ultra-wide 6.2-inch "Max Vision" Full HD+ display with a u-design and 19:9 aspect ratio. The phone has a layer of P2i water repellent coating. Motorola Unveils New Moto G7, Moto G7 Plus, Moto G7 Power, Moto G7 Play Smartphones; Prices, Features & Specifications. The device is powered by octa-core Qualcomm Snapdragon 632 chip along with 4GB RAM and runs Android Pie OS. It has a 12MP dual camera system with portrait mode, spot colour, cinemagraph, auto smile Capture and Google Lens. Flipkart Mobile Bonanza Sale 2019 Begins: Discounts on Realme Note 7, Redmi Go, POCO F1, Samsung Galaxy A50 & More. The phone packs in a 3000mAh battery with support for 15W TurboPower fast-charging. The Motorola One comes with a 5.9-inch HD+ "Max Vision LCD" display with 19:9 aspect ratio and a layer of 2.5D Gorilla Glass atop.